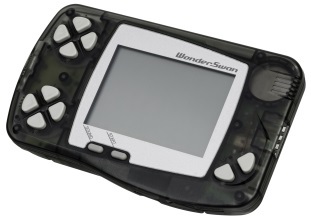 WonderSwan is a series of gaming handheld distributed by Bandai in Japan and some other asian countries. In total there were released three main revision of the hardware. The first was the original version which came out in March 1999 and had a monochromatic screen (eight shades of greys). This handheld was especially notable for the really low price (JP¥4,800) and the high battery life which could guarantee 30 hours of play with a single AA battery. Among the other dedicated portable console available at the time (Game Boy Color, Neo Geo Pocket) it also had better graphics. For all these factors the first model was a good success in Japan and it is by far the most available model thus the current average price is very cheap. 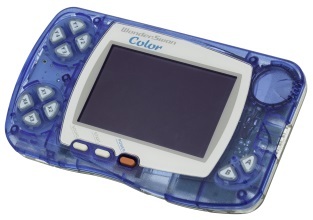 The WonderSwan Color was the second revision released in December 2000 which run both monochromatic and colored games. As the name implies the most noticeable addition was a slightly larger colorful screen in fact it could display 241 colors on screen out of a palette of 4096. The problem with the screen is that it is blurry in motion and not very reflective. Most importantly the WonderSwan Color got a RAM boost which is the primary cause for the incompatibility of many colored games with the original WonderSwan. However there are 22 colored games which are dual compatible therefore run also on the black and white model. These dual compatible game are easy to spot because they have on the upper right part of the front cover a special logo (see FAQs section). The only exception is Hataraku Chocobo/Working Chocobo which came out before the WonderSwan Color was available thus it doesn't have the dual compatibility logo but it display the game in color on WSC and in grey scale on the original model. To note that contrary of what happens on Game Boy Color the monochromatic games won't display any color on the WSC. Finally in 2002 Bandai released the last revision called Swan Crystal. Specification wise the Swan Crystal is the same as the WonderSwan Color what it improves is the actual screen which is a TFT LCD monitor. The new screen resolves the problem with blurriness the WSC had and displays a far more crisp image. 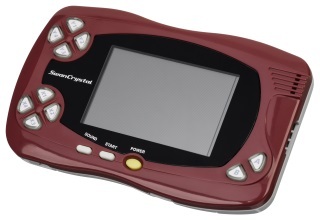 The Swan Crystal is the most rare of the three revision (my estimate is Bandai shipped around 200 thousand units) and it is also the most sought after due to being the definitive WonderSwan. All these factors make it the most expensive to acquire but it's well worth the money.